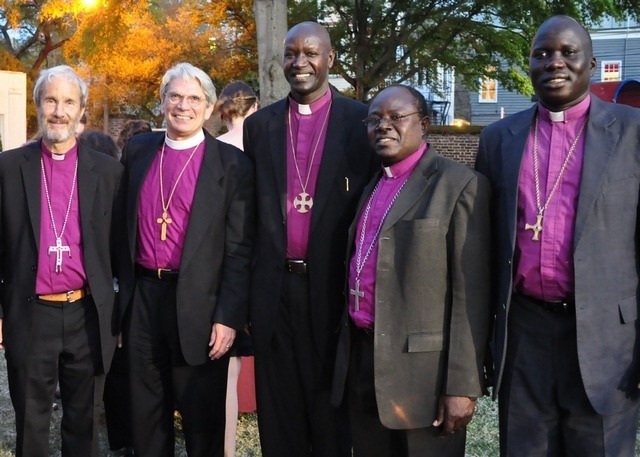 The newspaper story reports that four East Africa Anglican bishops visiting Charleston have expressed their support for the departure of Lawrence and much of his diocese from The Episcopal Church. The story reproduces the photo of the four bishops and Mark Lawrence provided by the breakaway group. The smiling quintet of bishops includes (L-to-R) the Rt. Rev. Robert Martin, Diocese of Marsabit, Anglican Church of Kenya; the Rt. Rev. Mark Lawrence, unaffiliated “Episcopal Diocese of South Carolina”; the Rt. Rev. Nathan Kamusiime Gasatura, Diocese of Butare, Anglican Church of Rwanda; the Rt. Rev. Elias Mazi Chakupewa, Diocese of Tabora, Anglican Church of Tanzania; and the Rt. Rev. Abraham Yel Nhial, Diocese of Aweil, Episcopal Church of the Sudan. The visitors are scheduled to speak at various South Carolina churches over the next few weeks. They will be joined in this enterprise by the Rt. Rev. Ken Clarke, Diocese of Kilmore, Elphin & Ardagh, Church of Ireland; and by the Most Rev. Mouneer H. Anis, Primate of the Episcopal Church in Jerusalem & The Middle East. Why hasn’t The Episcopal Church and the Episcopal Church in South Carolina (i.e., the real Episcopal Diocese of South Carolina) not produced a similar demonstration of support from friendly Anglican bishops? Are there no bishops in Canada, England, Scotland, Brazil, the Philippines, South Africa, or elsewhere willing to stand up for the continued integrity of The Episcopal Church and for Anglican comprehensiveness, as opposed to the Evangelical self-righteousness of newly minted “Anglican orthodoxy” or “Biblical Anglicanism”? I suspect that no public support has been forthcoming because no such support has been requested. If our church cannot actually mobilize the express support of any foreign Anglican bishops, it should rethink its participation in the Anglican Communion. It would be easy to dismiss the significance of the support offered by the East African bishops. Their opinion does not immediately affect the status of The Episcopal Church within the Anglican Communion or bring the schismatic “diocese” within the Communion. It does, however, lend credence to the assertions of Lawrence and his supporters. Visits of the bishops to Lawrence’s parishes will no doubt help firm up support for the South Carolina schism, which is less than universal. News of the bishops’ support may increase the approval of the Lawrence group within South Carolina and perhaps create doubts in congregations that have retained their Episcopal Church identity. Moreover, Anglicans around the world can surely be influenced by what the see (or don’t see) in the press. The larger question is this: Why has The Episcopal Church not worked harder at cultivating support within the Anglican Communion? Following the General Convention’s consent to the consecration of Gene Robinson, our church took much abuse in meetings of the primates and even in meetings of the Anglican Consultative Council. Why have we meekly taken such abuse, and why have we not sought more support for our positions? The extreme Anglican right has created GAFCON and the Fellowship of Confessing Anglicans. Why is there no Fellowship of Progressive Anglicans? Are we simply inhibited by our pathological niceness? If so, it is time to recognize that our theological enemies—and they are our theological enemies—are playing by different rules. Our Anglican propriety (and dysfunctional collegiality in our House of Bishops) can have long-term consequences—for The Episcopal Church, for the Anglican Communion, and for a Christianity motivated by love, rather than self-righteous. It is time to rethink our ground game in the Anglican church wars. Invite Bishop Desmond Tutu to counterbalance this treachery against fellow Anglicans and other spiritually more wholesome human beings. Robert Gillies, bishop of Aberdeen and Orkney, preached at Grace Church, Charleston - effectively, at this time, the diocese's pro cathedral. The panel discussion of Mark Lawrence's visiting bishop was apparently vary sparsely attended. I suspect that their visit may have been encouraged, if not motivated, by expenditure of part of the substantial diocesan funds, liquidated recently at some financial loss. See SC Episcopalians recent April 18th post (http://www.scepiscopalians.com) for more on the visiting bishops, and the March 8th post in the sidebar for details of the financial shenanigans of the secessionists. "No, we're the real Anglicans." I just don't see it, Lionel. Let's face it; the Anglican Communion is already divided. If the powers that be in the Anglican Communion, whoever they are, choose the other Anglicans over us to invite to gatherings and meetings, so be it. If the powers choose to invite them and us, so be it. The Anglican churches that wish to remain in communion with us will maintain the relationships. Those who don't, will not. Granted, the Communion is a mess. We pretend that it is a rule-based, genteel organization. In fact, members behave like characters out of the Wild West. We should recognize the Anglican Communion for what it is. If it is a “gift from God,” as some suggest, then it is clear that God has a wicked sense of humor. On a practical level, we TEC loyalists in South Carolina had to improvise the entire diocesan infrastructure on the fly. Remember, Bishop Lawrence took everything -- the cathedral, the files, the computers, the records, even the paperclips! So rather than a comprehensive PR strategy, there's been some occasional "counter-punching," such as local newspaper ads pointing out that TEC is alive and well in South Carolina. A real "ground game" requires people, money, time, and leadership. We have those things in SC, but they've thus far been devoted to a rapid reorganization. "Are we simply inhibited by our pathological niceness? If so, it is time to recognize that our theological enemies—and they are our theological enemies—are playing by different rules." There is nothing nice about telling LGBTQ people that they are sub-human and unworthy of salvation. 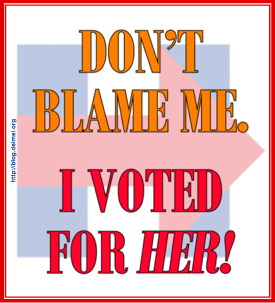 There is nothing nice about telling women that they're second-class citizens unwelcome to leadership roles. How many LGBTQ people have been actively driven away from a relationship with God because so-called religious leaders have treated them like pariahs? How many worshipers have stopped attending church because they're tired of politicking and intra-denominational fighting as practiced by Duncan, Lawrence, et al? As Christians, we have a moral obligation to reach out to people who are suffering, and make no mistake --- people are suffering from the actions of Duncan and his followers. Obstructing people from a relationship with God is downright evil. I find it frankly amusing when ACNA supporters accuse +Katharine and TEC of being "dictatorial"; I think they've been much too deferential. They could use a little more fire in the belly. "Onward Christian Soldiers" isn't just a hymn that we sing once in a while. I think we’re on the same page, but I’m not completely sure. I was using “pathological niceness” to refer to the way we have treated, for example, primates from East Africa. We should be telling them (1) that we think they’re wrong about [fill in the blank] and (2) that they shouldn’t be interfering in our church. If you’re suggesting that our failure to do that is hurtful to LGBTQ people, then we agree. Yes, we're definitely on the same page! And I agree it's become pathological. We (as a group) seem to trying to avoid confrontation, which might work if all sides were acting in good faith. But some of the people involved have a fairly mean-spirited agenda and are purposely provoking confrontation --- "picking a fight." To try to avoid confrontation at that point is to become an enabler of bad behavior. If our position is ethical (and I believe full inclusion of women and LGBTQ people is ethical) than we have a moral obligation to defend it vigorously.